How can this hybrid (the Max Brand Synthesiser, a.k.a. ‘Moogtonium’) be augmented without losing its specific character? How can the playing techniques offered by the synthesiser’s interface be integrated and enhanced? How many musical and timbral similarities with the Trautonium or the Subharchord would I discover? How many similarities with a modular Moog Synthesiser? “erbteieloomen 0.1” is the first work in a loose series of pieces that explore the possibilities gained by tight but gentle integration of a computer system into vintage analogue synthesiser hardware. Similar to my digital instrument ‘scivolo’, the computer plays an important role in the creation of “erbteieloomen” but stays in the background. While deliberately based on off-the-shelf hardware and software, specifically created code allowed me to greatly enhance the sonic options and to remotely control the computer. In my ‘computer augmented’ approach I carefully replicated the synthesiser’s own resources by accurately recording control voltages and audio signals and feeding them back into the piece’s patch. Consistently, no audio processing took place on the digital side of this setup. 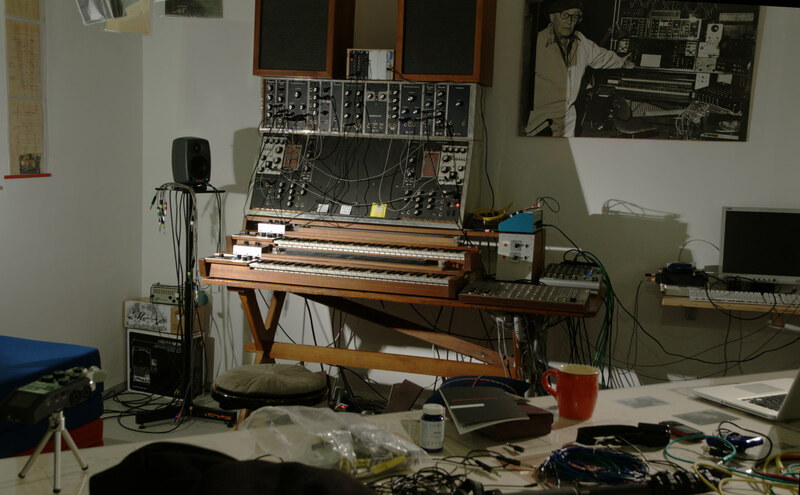 The computer is entirely controlled by the synthesiser’s physical contraptions: Its lower keyboard is read by the interface situated between the computer and its control voltage output, and accordingly interpreted to trigger the associated actions. Pre-recorded modulation voltages are also fed back into the patch. Previously prepared sound elements are played back and mixed with the synthesiser’s live signal. For creating the basis of “erbteieloomen 0.1” I picked three characteristics of the Max Brand Synthesiser: Its ability to have 12 oscillators sounding simultaneously, along with their ‘liveliness’ in terms of tuning (in)stability, and the slow and seemingly never ending droop of the keyboards sample and hold circuit, which provides me with a long and slow change over the course of the piece. Every sound in this piece was generated on Max Brand’s machine. The presented audio file is a live recording of the concert from Jan 17, 2014.